The Ghaziabad Development Authority (GDA) has started replacing 9,000 initiated the process of converting nearly 9,000 sodium-vapour streetlights and fluorescent tubelights into LED lights. This initiative is a part of the corporation’s effort to replace 60,000 such streetlights with LED. This will save power and lead to better lighting. “We are about to take up the memorandum of understanding (MoU) soon for the project after final discussions on the costs. The agency has quoted a high price and we plan to negotiate the cost. 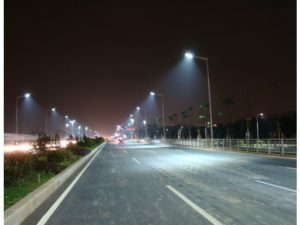 Nearly 1,000 streetlights have been converted in the pilot phase, while the rest will be done up after the MoU is signed,” said Ritu Maheshwari, Vice-Chairperson, GDA. With LED streetlights, GDA will save 4.31 million units of electricity per year, amounting to savings of Rs 14.27 crore per year in electricity bills. “Apart from this, we have also sought a sanction from the state government for converting streetlights under eight local bodies to LED lights,” Maheshwari said. In Indirapuram alone, GDA has identified 63 of 1,026 streetlights defunct. In Madhuban Bapudham area, 157 out of 1,051 streetlights were defunct. The assessment for Indirapuram, Koyal Enclave, Raj Nagar Extension and Tulsi Niketan, among others, was also taken up.